Landing pages are the important parts of your site where you want to encourage people to perform actions, and therefore play a key role in your pay per click (PPC) advertising campaign. 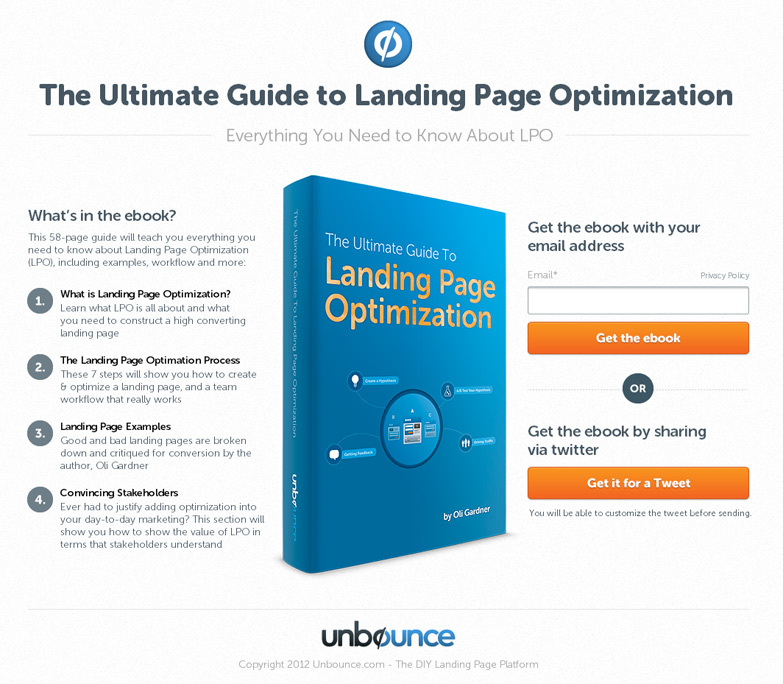 Good landing page design is also vital to attract relevant organic traffic too. 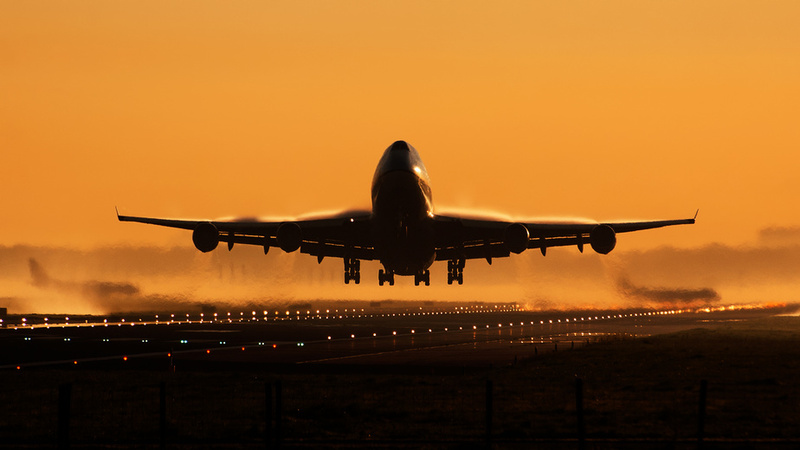 Here are 12 landing page design tips, compiled with the help of Matt Pilkington at Superrb, one of our partner agencies. The graphic below is a reworked version of this original at Kissmetrics. Your main headline should not describe your product or service; it should tap into the emotion of the reader. Think about newspapers as an example here. Which headline is more likely to persuade you to read a story? ‘Prime Minister shamed by gobby housewife’? ‘Woman complains to Prime Minister’? The Evernote home page is succinct and it focuses on the core benefit rather than the features of the product. Emotive headlines like ‘Try our mouth-watering cakes’ and ‘Get slimmer and fitter faster’ engage the reader’s senses or enable them to imagine a positive end result. The sub-heading can be more pragmatic. Whilst the main headline is about getting the reader to pay attention, the sub-heading explains what your headline relates to and what it is you want them to pay attention to. No matter how much you write on your page, people generally don’t read it. Copy is useful for those who want to read it but, on a landing page, visitors are busy searching for whatever they came to do. They are looking for the quick visual cues that give them your phone number, take them to your contact page and show them examples of your service. The majority will ignore big blocks of text. This example from landing page design specialist company Unbounce summarises features in clear bullet points. Testimonials from real customers prove that you can deliver what you promise. Be sure to cite the source of each one. 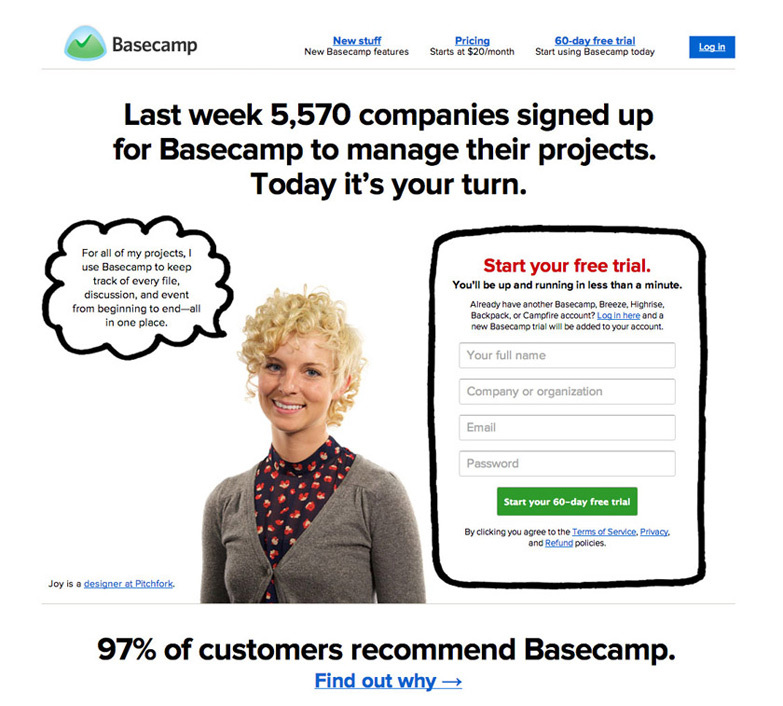 Basecamp’s use of real users’ photos on its home page shows the types of professionals who use it. With the call to action, position, size and colour come into play. The eye should be drawn to it immediately, so there must not be too many distractions on the page. 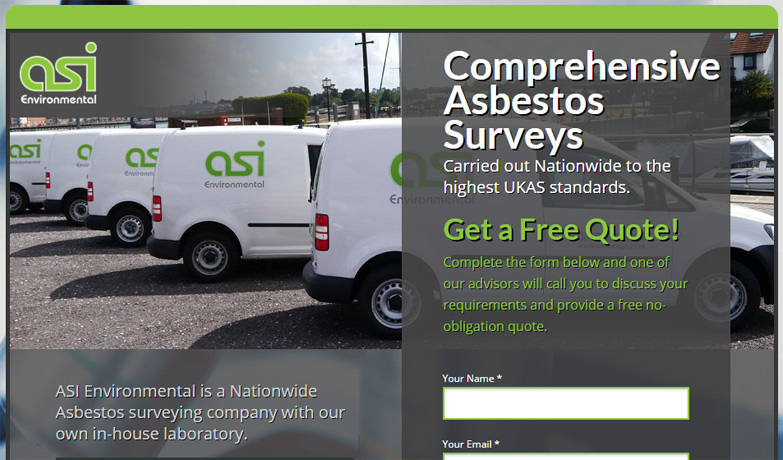 The ASI asbestos page has a clear call to action – ‘Get a free quote!’ – just above the form. A clickable button in an action colour, like orange, can improve the response to your call to action. The call to action might tell visitors to ‘click here’ or ‘download now’, but the button will improve chances of a click because many people need an instruction and something obvious to click on. 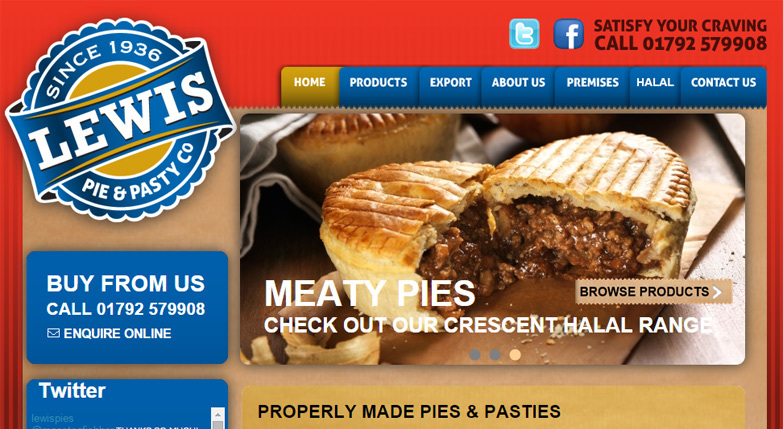 There’s a lot going on on this page, but the ‘BUY FROM US’ button is easy to spot. 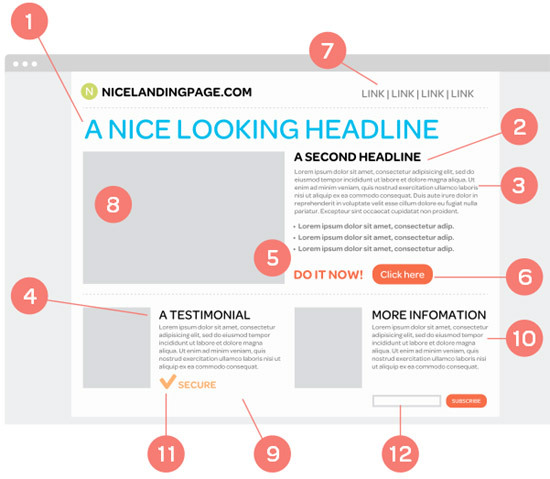 Cut clutter from your landing page. The more links there are on the page, the more likely it is that your prospect will follow their nose to other pages of the site, and perhaps even to another site altogether, without carrying out the action you wanted them to perform. 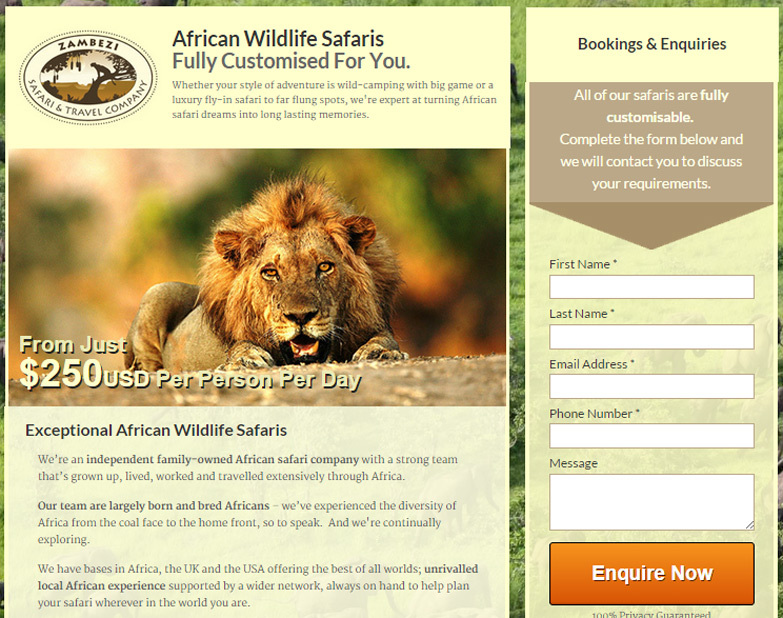 The landing page for Zambezi Safari & Travel Company doesn’t feature site navigation or links in text. The only thing visitors are encouraged to do is fill in the form. Images are important, not only to make the page more attractive and to show your product, but also to improve the sharing potential. Plus, you can boost traffic through Google Images. A growing number of companies are experiencing the benefits of hosting video on landing pages, as they increase engagement and help demonstrate the benefits of the product or service in a succinct way. The Skype home page features a background video instead of a background image. The call to action must be visible without the user having to scroll. You can have a form that runs down the page, but the eye-catching element should be easy to spot instantly when the page loads – even if you repeat a call to action at the bottom of the page. 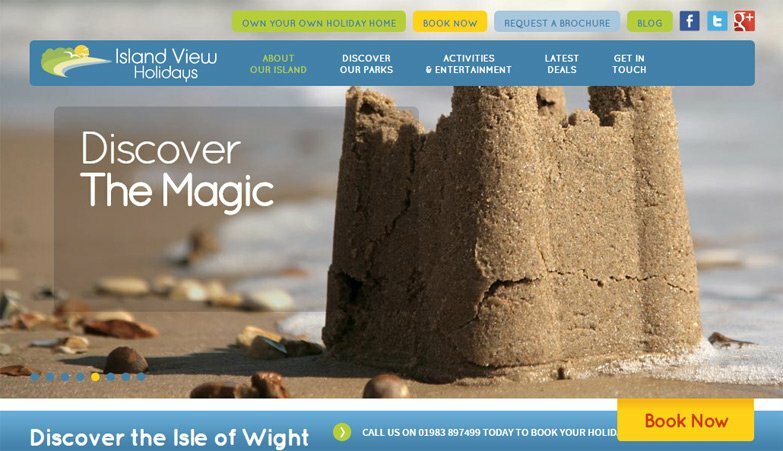 Island View Holidays has a bright booking button, but also a persistent bar at the bottom of the screen. This disappears once you scroll far enough down the page. Having kept copy to a minimum for the key points, a ‘more information’ box shows that there is more to read. If a visitor wants to explore in further detail, they can. Remember not to send them away from the page though, so think about ways to keep them on the page, or take them to a secondary landing page where the additional information is visible, but calls to action are not lost. 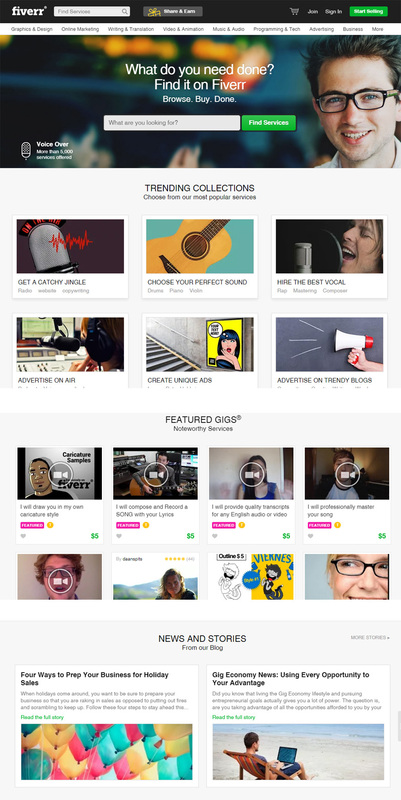 The Fiverr landing page features a simple header area with limited text and a strong call to action, but as you scroll down, there is a lot more to read. Logos from trusted bodies or padlocks to show that the site is secure can help to build trust with your customers. Sprout Social features a list of client logos on its home page. Encouraging users to subscribe to a newsletter or like you on Facebook is a good way to encourage interaction where, perhaps, a full conversion doesn’t happen. The British School of Motoring dominated its home page with this image, encouraging people to share a selfie on the hashtag #bsmselfie. If you need a helping hand when it comes to landing page design, don’t hesitate to speak with our PPC and design specialists. Give us a call or fill out a form and we’ll ring you back.